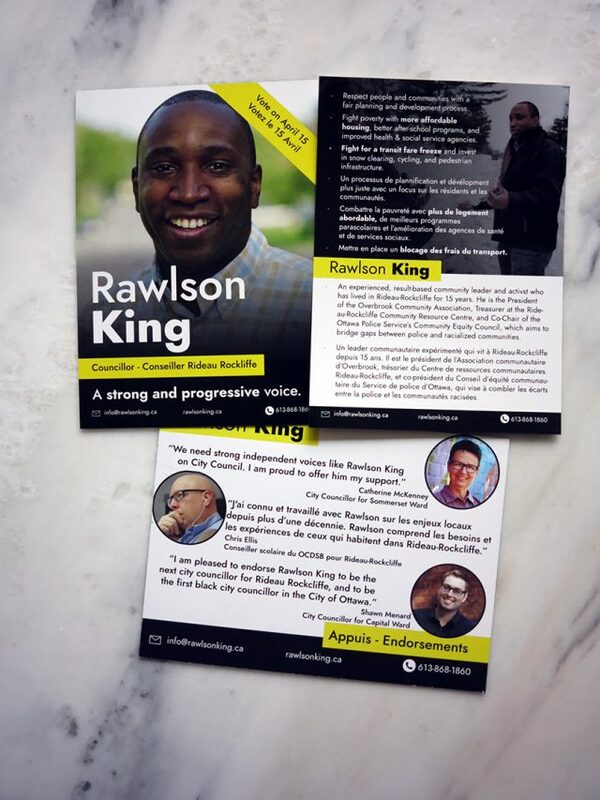 I had the chance to volunteer on an election campaign for someone I believe is worthy of a win – Rawlson King (www.rawlsonking.ca) for City Councillor. Over my time living in Ottawa I have appreciated how my community comes out to support each other with our professional and personal endeavours. Rawlson is one of those people so I was happy to come out and support him along with many others. Rawlson is someone who was already out there walking the talk as a volunteer before he decided to run in this election. And, as he has “lived in Ward 13 [Rideau-Rockcliffe] for 15 years and has been an active volunteer for 10 years on a wide range of civic issues” I know he has a sense of what my neighbourhood and surrounding area requires. Our ward is a diverse one with many unique issues. It takes someone who has experienced this to know how best to help. If Rawlson wins the election he will be the first black city councillor ever elected in Ottawa. If you are in the Rideau-Rockcliffe ward and are voting today, take a look Rawlson O’Neil King’s platform. To find out where your voting station is click here.